Well; now I know how a student feels! I realise that this is not a logical feeling but the terminology of being ‘assessed’ is associated with exam results, scores, have I done enough to pass. 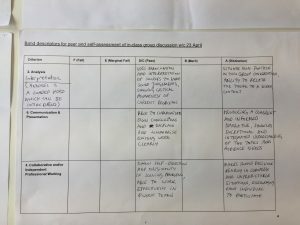 As a lecturer who has just assessed his students I aim to give constructive criticism so why would I feel I would not get the same treatment when I am being assessed? Because, like a muscle memory, it is a process that was instilled in us from early youth; if I don’t pass the grade I’ll have to re-sit the exam, re-do the work, have Mum and Dad to answer to… it’s loaded with negative feelings. What are positive feelings of judgement and how do they compare to negative feelings of judgement? 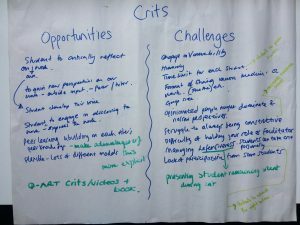 Constructive criticism does not rely on pass or fail scenarios; surely, if we dispense with marking then our students might feel less intimidated, they might learn again rather than study simply to pass an exam. Managing anonymity and confidentiality in social research: the case of visual data in Community research – a research paper written by Graham Crow and Rose Willes (ESRC National Centre for Research Methods NCRM Working Paper Series 08/08) writes about the potential clashes of revelation due to the visual means of research. I am interested in this as my Questionnaire is deemed anonymous (it asks for no signatures, printed names, and, though it asks who may have advised the responder to study a PgCert it states in the question not to give their name but their role in the University). However; I had asked, in the last question, for the responder to draw something that sums up what the PgCert means to them. Can this be construed as an identifier? Can the responder’s handwriting be construed as an identifier? My belief is that it might not – yes; sitting on the fence a bit – if the responder’s answers were to be typed up / transcribed then there would be no difference (everyone stepsons would be typed in the same font) to identify. But the image can not be homogenised in the same way. I could collate the images in a separate location so that they have no ‘tag’ to their responders’ answers but does this take away the power and translatability of the image? Surely the context would have been diluted, the results of the questionnaire’s are brought into disrepute perhaps if the images are separated in that they become simply visual responses whose context can only be guessed at without the supporting answers. I do not wish to identify the responders; the answers could be construed by the University as antagonistic, revealing beliefs that are not shared by line managers (or staff with more responsibilities), I need to have the trust of the responder to be able to get as honest an answer as they can provide in a safe environment (not putting them at risk of reprisals). This paper has made me aware of the many pitfalls I could fall into with regard to making assumptions about identifiers, how we are able to glean identities from the style of a drawing (Picasso, Durer, Michaelangelo (though please don’t assume that the images drawn on the questionnaires are in any way comparable to the genius’ mentioned above! )), how locations of responders can be revealed with photographs, maps, social media data. I am surprised by how much I have crammed into the last few weeks… not feeling confident about the course, the elective unit or how to use blogs or workflow have, at times, felt like climbing a vertical wall. On reflection I realise I much prefer being taught rather than reading (dry, often arid, high brow, academic writings). 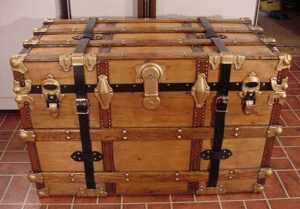 Practical has always been stronger than theology or philosophy, though psychology has also been strong subjects for me. i can relate to many of my own students who find dissertations, essays, written justifications harder than their peers. By understanding this I empathise with them, I can help them find ways through the difficulties using many other techniques like pre-recorded video presentations, sound bites, bullet points (if any of these are technically allowed by the university then this would certainly help with inclusivity and diversity levels). That is not to say that I have not found the studying worthless. It has, again on reflection, got me to challenge my prejudices and my preconceptions. I have truly enjoyed and garnered many references, sources of benefit and reason but still feel a little frustrated by the lack of practical things that help me teach my students better than I am currently doing. Having no teaching training experience prior to teaching 4 hours a week on the Foundation Course I have struggled to accept that my abilities in this field are up to the requirements and, at 52 years of age, I feel I am slower than most of my peers. I even enrolled on the 2 day UAL course “Thinking Teaching” but, like this PgCert, found its over use of pedagogic references and acronyms and mountains of research reading to ‘consider’ reading all too much to be of benefit. ‘Teaching training’ is what I would probably call what I wanted most. But I’m two thirds the way through this course… I will persevere and, hopefully, surprise myself further. What is wrong with these band descriptors? The difference between the descriptors for D/C, B and A is not always obvious. Some aspects of the standard descriptors will not apply to all assessed tasks. The descriptors for the F and E grades are rather unkind. In many cases, the descriptors for D/C expect a lot from students – could some be distributed to the B descriptor? No differentiation between D and C grades. The language used in the descriptors is confusing to understand – criteria need to be written succinctly and in plain English. Learning outcomes and student self-assessment are not currently addressed within the matrix. As a group we were unsure whether this band descriptors had been co-created with students. We felt that it was important to work with students to agree on their interpretation. Is there anything good about the band descriptors? Clear developmental progression between each band descriptor. Grid layout makes each descriptor to pan easily. The A descriptors are aspirational for high achieving students. The discussions that we had during the exercise made me revisit my own prejudices and poor use of English language. I need to concentrate more on the different bands and what separates them (e.g. exceptional and excellent) to assess accurately and fairly and also consistently the students work against one another. I do find this already quite difficult in Design education. 4 ‘D’ stages of process: Discover, Define, Develop, Deliver. 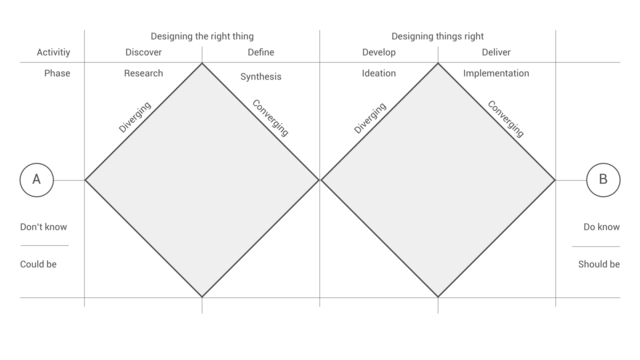 This model indicates that divergent and convergent thinking are needed throughout any creative process but emphasises that this cycle happens twice: once to confirm the definition of a problem and again to create the solution. 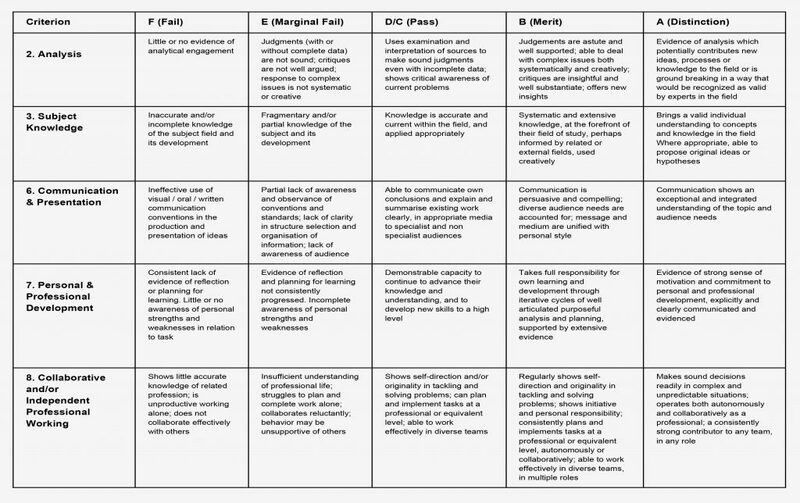 Although presented linearly, it focuses on how different criteria and teaching methods need to be chosen and applied at different stages in the creative or design process (Designed by The Design Council, 2005). 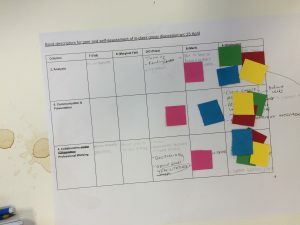 Assessment, learning outcomes, marking criteria, the students’ preconceived expectations and a course’s aims are all aligned (Biggs and Tang, 2011). 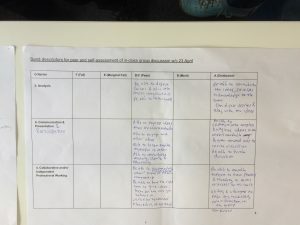 Students set their own learning goals; their work is assessed holistically on previous work rather than against set criteria. For me, this form of assessment treats the student as a whole person and privileges their own personal knowledge and experiences (Hooks, B. 1994). 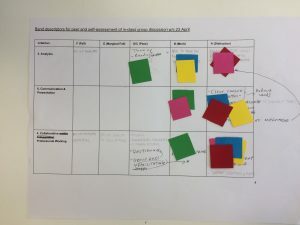 Ipsative assessment means an assessor makes comparisons with a student’s previous work to record progress and this enables learners from all backgrounds to achieve an academic ‘personal best’. This is widely quoted as an under-used approach as it requires a radical rethink of years of tradition assessing. It is especially useful and energising for students with low self-esteem, mental health issues, shyness, Dyslexia etc. Accardi, M. T. (2013) Feminist pedagogy for library instruction. Sacramento, California Library Juice Press. Hooks, B. (1994) Teaching to transgress: education as the practice of freedom. London Routledge. Nixon puts forward important valued approaches in all aspects of teaching from the values of empowerment, of transformation, and an shared understanding of knowledge. Since tuition fees were introduced for all students Nixon’s valued approaches should be more valued and shared across the globe. We debated in class if the role of Universities can also consist of career development (maybe a contradicting point of view to Nixon’s). If the knowledge we teach students and the many experiences we have as practising artists are ways of thinking of their subject then the students will benefit from university education using these ‘ways of thinking’ to help them find meaningful and creative work in the future. 1: Are all views worthy of our efforts to understand them? Listen to others before making a decision. Is there a tipping point so everything becomes flat and diluted? All views are valid. Views that we don’t agree with are especially interesting as it ensures that we can engage in fair, diplomatic and objective discussions. The ability to articulate our own views and the ability to understand, unpick and challenge these and the views of others is what education is good for. However not all views can withstand all effort and time. I think that these skills help us to communicate more successfully. They allow us to challenge views and decisions made by colleagues, Students and Authorities that we feel are oppressive and harmful to us or others. 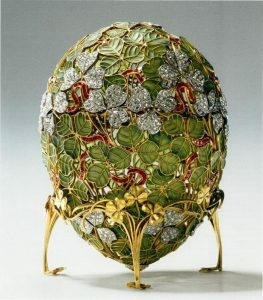 2: To what extent should traditions be protected (from other/new ideas)? One is always at the expense of another (for example: classic versus modern minimal). New ideas, new technological advancements can be engaged with whilst also protecting traditions that we feel are important. Picasso couldn’t move to cubism if he didn’t know how to life-draw. 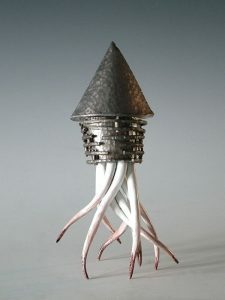 Perhaps there might be a fear that the traditions might become muddied or infected with newer models / ideas that chip away at the pure traditions – I think they should be able to co-exist – giving the experiencer a rounder view of what has been achieved to what can be achieved in the future. 3. Is a technical or ‘useful’ education a second-rate education? Creative subjects are taught in private educational establishments; why is there such a perverse difference in opinion? The result is that another myth, deeply embedded in our British psyche, is being reinforced: that culture and creativity belong naturally to the elite, that they are not for everyone. And this problem affects us all, because the whole economy needs creative skills. According to the World Economic Forum, by 2020 creativity will be in the top three most important skills for future jobs, alongside complex problem solving and critical thinking. Which are skills innate to and honed by a creative education. A contra argument could be levelled that a technical education can be of great value but it should be a choice and it shouldn’t necessarily be at the expense of one that is also academic. What is a useful education? Useful for what and for whom? Is there an argument to say that a technical education is a useful one for the benefit of others; hence the need for skills and technical knowledge to pick up speed. 4. How can the technological and the cultural be merged? I.e. is it possible to teach for liberation and transformation, AND to prepare students for socially useful occupations? It is not easy to think of a reason how it can. It depends on the agenda that’s driving the type of education and what reason the students are there for in the first place; it may be considered a finishing school “I don’t want to make a decision about my career just yet”, “It’s a filler till I get married”, “I’m not good at anything academic”; so the socially useful occupations would be filled by socially aware students (even before they venture into HE). Most things in society are seen in terms of profit, The NSS might also reveal this is a fear of graduating students that they need to earn a living wage. This position determines the subjects that are valued and, as a result; the kind of courses that universities offer (the success of CSM Fashion MA is held as a milestone; I think it is a poison chalice. The course is so popular that the course has the rare choice of whom it offers a place to. It is also the wealthiest course in the entire UAL catalogue. Is this course subsidising others at UAL: no. CSM is in the black, CCW, LCC, LCF are in the red. Will the MA course prepare students for socially useful occupations? No; it’s dog-eat-dog. This does seem to be the direction that HE seems to be following – Nixon ends the chapter by describing how the ‘technical revolution’ of Snow and the ‘cultural turn’ of Leavis have merged due to to the ‘massification of higher education’. Universities needs to aim for the student populace to mirror London’s multiculturalism which would allow for both the public good and the private good in education. 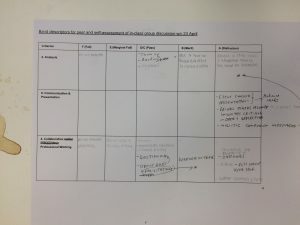 5.How do these ideas connect with the theory you have been encountering on your elective unit (if you are doing one)? They connect very strongly to issues of diversity and inclusivity. Listening and sharing knowledge, learning to communicate better and understand each other is essential if we are going to value and learn from each-others difference. Widening participation is essential if we, as an educator and facilitator, want to change the white face of middle class privileges. Less affluent children have many obstacles in their way, they may apply for sponsorship but they will be faced with white faces, white history, white traditions – Technical and Creative educations are, arguably, a way to channel working class students away from peer pressured low level jobs or Academia and into industry. 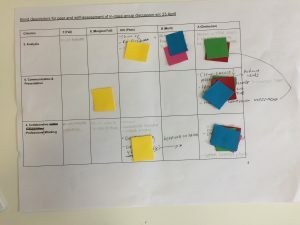 A ‘Paper Chase’ Activity of different types of teaching. The opportunities and challenges they may have and the strategies that could be taken to resolve the challenges. Below are images and my notes I took down as we were discussing in our group. Too intense for some students – shyness? 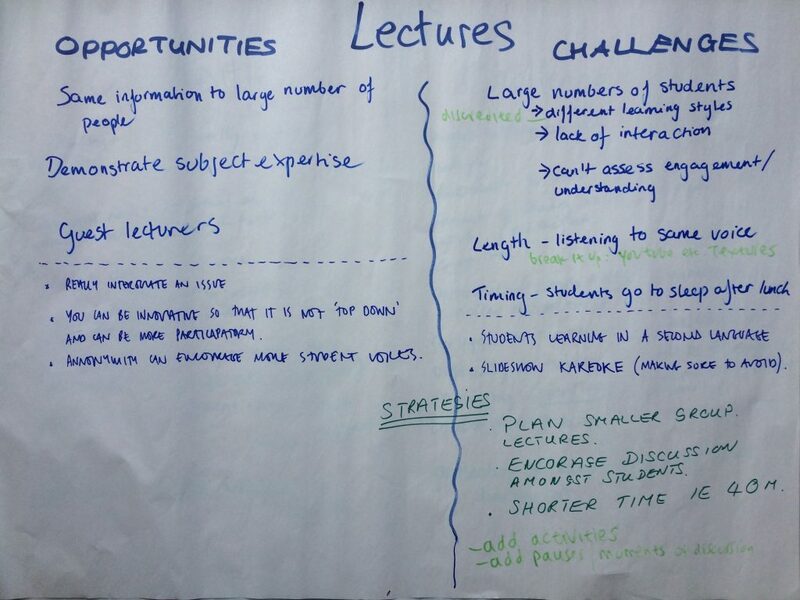 Lecture capture – upload on social media eg. Youtube/moodle could help with the overload and attendance (for absent students) though this makes it easier for lazy students to not bother to attend. Allowing students to send questions after or while lecture on an online platform eg, google doc – students could type questions anonymously and tutor would answer at the end of the lecture or at the start of the next lecture or could respond on the online document for students to go back and read. This will assure students that their questions will be answered even if they are shy and can’t speak up or approach tutors. Encourage equal opportunity within groups – timing each student or giving students information before the session to prepare themselves so each student has something to say. However this can be a problem for really shy students, as they won’t attend. 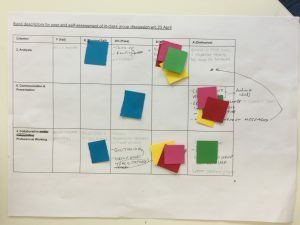 I was struck by how much work and engagement this session had; it was a great way of getting loads of information down very quickly and, due to the quick turnarounds, it meant that we were looking at new contents/observations which focused us to work straight through for 30 minutes. Though the engagement of people within the group can be unequal. A roaring success for me as it helps define how I might need to amend my teaching practice. I was fascinated as to how National Student Survey (NSS) results can effect funding and the national standings of the Universities; fascinated and rather disappointed too. The higher up the podium, the more what? Students? Funding? Prestige (and all that it can bring with it)? I am very interested in the student experiences and what the students felt about their time at University, the teaching standards, their outcome, the support, what they felt about the student numbers in each class, the quality of feedback and assessments – so much that we can learn about how the students appreciate our input. This session explored student experience through the assessment and ranking of universities and the Teaching Excellence Framework. It was interesting to see the historical and political aspects of that frames current issues of university status and was dismayed by UAL using factors including old Alumni, old bygone status, (quality of teaching spaces (not including LCC or LCF or Wilson Road), a rich history (when students got value for money? ), redevelopment and relocation of campuses (Granary Square is leased and may have to move once the lease has expired), Government sponsorship (our overseas enrolment is ever-increasing so our reliance on sponsorship (Beijing) should be decreasing but our investment in International support is not increasing exponentially). We may not notice it but State funding for Universities has increased even though students are now expected to pay up to £9250 per annum. Funding comes directly from the Government and was differentiated in allocation of money according to subject. Arts and humanities courses were affordable to teach as they could access books from the library and so on. Science is a bit more expensive to teach and Creative Arts was even more as their expenses on spaces and resources materials et cetera. Tuition fees were introduced in 2014. The Government suggested a minimum and maximum fee that students would pay. Not unbelievably; most Universities chose to aim for the higher rate due, in part, to greed and also to combat their fears of state funding being reduced or ceasing. So an Arts University based in London is already at a huge disadvantage (Arts Education is one of the most expensive courses to study, London’s ground rents are extortionately high due to it’s popularity both home and abroad). The conservative Government is attempting to reduce it’s funding so that the Universities will become self-sufficient or get sponsorship from other sources (CSM have many sponsorships but there is an invisible cost to the students where, for example, the recent graduation shows in 3D and Jewellery showed Louis Vuitton, Joseph Joseph, Swarovski etc. all stamped over hoardings and much of the students work too). We now consider Students as consumers investing in their own education, they have been covered by the Consumer Protection Act since 2014 so the focus on student satisfaction has become significant. Having to quantify this satisfaction is, in some part, noted by students filling out the NSS form at the end of each year’s study but its use becomes political as a use of league tables can suggest that students will use the results to determine which institutions they want to study at in terms of ranking and categories that supports learning experience. Universities with a good classifications (silver or gold) will affect their national and international status thereby cementing the importance of good feedback in the NSS. So with the university ranking systems and classifications of gold silver and bronze the NSS becomes more important; the pressure to maintain or increase the ‘grade’ is borne by the staff on the cliff face; the lectures and admin staff. During the session we talked about the issues that teachers face in being forced to ensure that their students must fill out the NSS and, indeed finding ways of encouraging and, in some cases, enforcing that students participate in the survey through emotional blackmail or outright bribery. It would be hoped that students who have a strong opinion on their university experience will use the NSS survey to express their feelings clearly and openly. The NSS forms are be collated, data obtained and the results can then be ‘sprayed’ back over the staff for adjustments or radical shifts to be made to ensure, for the right reasons, the students in following years will be rewarded for their openness by the improvements that staff and the University can make… I absolutely agree that the students are central but I do worry that too much emphasis is put onto a survey where the students may not be quite open to the benefits that take time to digest, install, bear fruit. In the spirit of the Munday paper on problems and mysteries, we spent the middle section of the seminar we looked at something that is often framed as a problem: ‘Student experience’ and the assessment and ranking of universities through metrics like the National Student Survey (NSS) and the Teaching Excellence Framework (TEF). The NSS survey questions are not specific to any subject so as to allow a fair response no matter what subject a student is studying. This may be the fairest way but the generic questions can not relate to every subject taught in Universities across the UK. This would imply that some subjects may be at a disadvantage due to the less than helpful range of questions. Is this the fairest way of evaluating the students’ experiences at University? 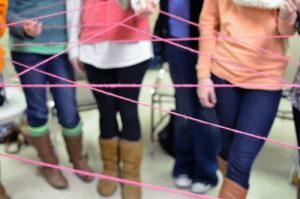 Using string, each participant would pass on a ball of string having answered a question as to form a physical link and visual network of conversation between the group members. Using some playing cards where each turn of a card one would answer a question posed by the peer in the group. If more than one person thought the same then it would result in more cards being thrown in. Both games are based around Gadamer’s play and game which can monitor the frequency of one’s participation in a discussion. 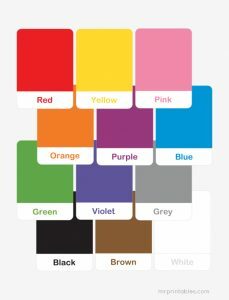 These help trigger a brainstorming across the group. These kinds of games can help our students to consider their participation. As well as providing a visual representation, they tend to bind the group together (quite literally in the case of the string game) and create a collaborative rather than a competitive vibe and begins an understanding of the dynamic of discussion and unpredictable participation of ‘players’ especially on how ideas can crop up through being inspired by others’ thoughts. 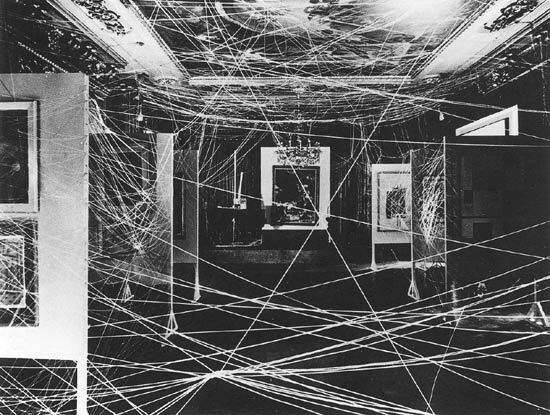 Does the string generate a collective desire to equalise the participation due, in part, to the geometry and the equal stretching of the string and a natural competitiveness? Interesting conversations arose from this active learning through game playing exercise. 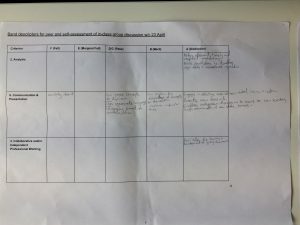 This was an engaging task which I must consider using within my teaching/learning practice either as a lesson starter or introductory to a new project brief. It’s a way of students learning from each other as well as the Teacher learning from the students; like the web of string or cats’ cradle it is a perfect metaphor for the interconnectivity of information and the to and fro of learning. I might push for this conversation, debate and discussion in my classes and though I’m not responsible for the briefing I can stretch the lesson plan as far as I am able. It means I could take on a ‘phenomenological observation’ when students are working in groups to answer a question I set out to them. Remain alert, as Lindsay advises; as one person’s lack of enthusiasm for the game can kill the atmosphere. “Seriousness in playing is necessary to make the play wholly play. Someone who doesn’t take the game seriously (as in “it’s just a game’”) is a spoilsport.” (TM 102), (Vilhauer P35). People are mirrors – we are strongly affected by those around us. Vary the starter/practice question as appropriate. Using ‘what I dislike about group work’ might work for less enthusiastic groups as it indicates that you appreciate the challenges and are inviting them to air their grumbles. This is best kept in reserve, otherwise it can depress an initially positive mood. 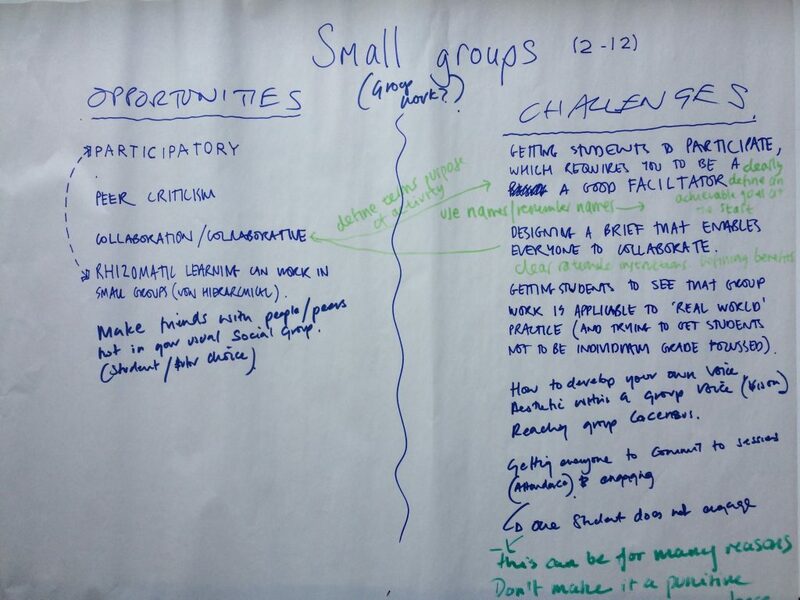 I’ve also used the question ‘is equal participation important in group work?’ as a basis for discussion, which can generate some very deep questions (e.g. What do we mean by equal? Is equality always a good thing? ), but bear in mind that not everyone will enjoy or find value in plumbing these depths. Monica Vilhauer ‘treaty’ on Gadamer’s text is academic in prose, and, when able to cut through the dryness, convoluted philosophy and heavy laden language, I can get the gist. The act of playing requires a to-and-fro: with Art this might be a constant questioning by the viewer and revelation by the artwork, once revealed more questions then more revelation etc… “The movement to-and-fro obviously belongs so essentially to the game that there is an ultimate sense in which you cannot have a game by yourself. In order for there to be a game, there always has to be, not necessarily literally another player, but something else with which automatically responds to his move with a countermove. Thus the cat at play chooses the ball of wool because it responds to play, and ball games will be with us forever because the ball is freely mobile in every direction, appearing to do surprising of its own accord. (Gadder, H.G. 2004 Truth and Method, 3rd edition, London Continuum. p106)” (Vilhauer, M. 2010, Gadamer’s Ethics of Play: Hermeneutics and the Other, Plymouth, Lexington Books p33). Chapter 3, the one to read, talks explicitly about how we engage with, understand and play with various art works/forms, but it also leads us to consider Gadamer’s ‘hermeneutics’ more broadly, and relate it to other educational relationships (between learners, teachers, colleagues, texts, etc). Play is a movement that one cannot create by oneself, it is participatory and can be used as an experience or process to show and see. I only now see this process in my language and interaction with my students, where there is a constant to and fro /dialogue / Q/A between the student and myself, we both try to work out their ideas and put them into words or images or research material. 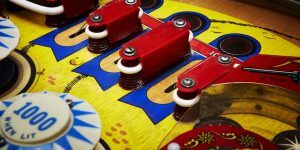 It’s a game of pinball. “Gadamer argues that the same is the case with the “picture,” whose mode of being is also presentation and which should also not be conceived as a “copy.” The picture too is an ontological event in which being appears.” Vilhauer p43). Quite heavy stuff for someone studying a non-philosophical practice. Ian Munday’s 2012 conference paper ‘The Classroom Space: A Problem or a Mystery?’ (Chap. 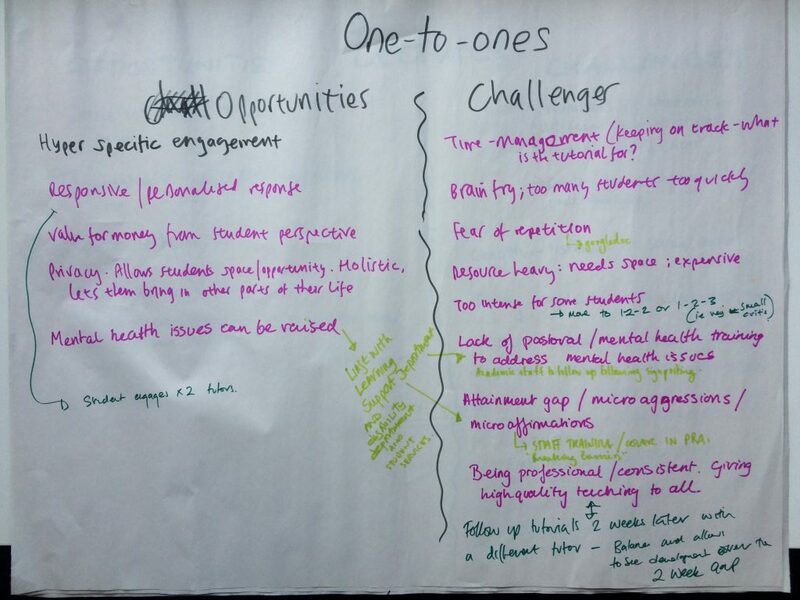 11) pays attention to another educational practice context. Researchers from different backgrounds see the educational space as a site for solving problems- teachers and children will be emancipated and students will become more effective learners. What does it mean to think of the classroom as a space of mystery rather than a site for problem-solving? Munday draws on the work of existentialist philosopher Gabriel Marcel: ‘A problem is something met with which bars my passage. It is therefore before me in its entirety. A mystery, on the other hand, is something in which I find myself caught up, and whose essence is therefore not before me in its entirety. 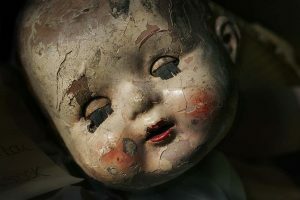 It is as though in this province the distinction between in me and before me loses its meaning’ (Marcel, G. 1949 The Mystery of Being: Mystery of Being Reflection and Mystery Pt. 1. Gifford Lectures p109). What might the loss of a distinction between in me and before me mean for teaching and classroom research? 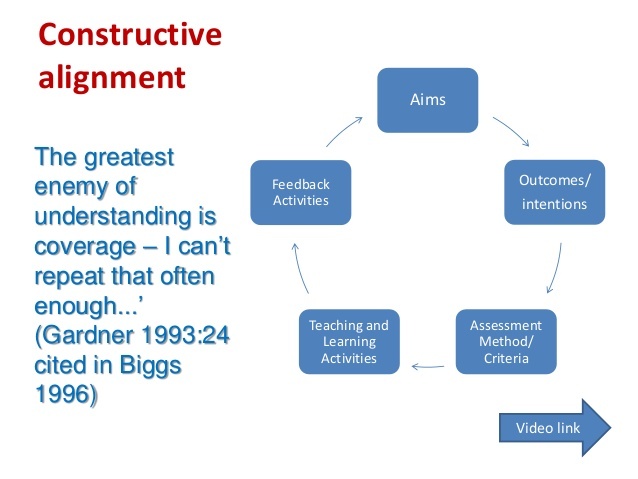 This is discussed in relation to his own experience of both school teaching and working on a practitioner research course that employed the pedagogical model of blended learning (where most of the teaching took place online). He argues that the virtual spaces (forums and chat rooms) are suited to a pedagogy that favours problem-solving at the expense of mystery. He considers the notion that cyber pedagogies fit in (too) neatly with both current conceptions of practitioner research and school teaching more generally. “All three are bound up in a libidinal drive to solve problems and delimit the classroom space”. It’s the theory of knowledge, everything’s up for debate. A comparison to Samuel Beckett’s seminal work Endgame clarifies the text in an incongruous manner (just like the play) but the play has been over analysed and dissected so much that there is almost no mystery in the play once it’s been studied. Getting students to collaborate at the beginning of their studies (Diagnostics) at Foundation has quite a few failures. Through shyness, lack of self-confidence, prejudices, religious or gender politics, mental health etc. students will often not take easily to collaborating and sharing ideas within a small group (roughly 5 or 6). Giving them 3 sound bites and 3 photos and giving them 2 days notice that we will ask the groups to chose 1 of the 6 provided ‘items’ and to create a story from it. The outcomes have been rather hit and miss where a more outspoken or confident member of the group will take charge often trouncing over other, as valid, options. I’d like to review this technique so as to give everyone own the group an equal voice regardless of the circumstances that they are in. I would like to develop a brief that I tried during an Insights programme last year with a group of students from a variety of backgrounds, ages, cultures and some with English as a secondary language. It consist of a number of small, postcard sized images, all different, each placed inside sealed envelopes. There was no collaboration in this original brief so I want to amend it to suit this project. The brief is given to the students who will act independently for the first stages of the brief. To ensure that the questionnaire isn’t too wordy or confusing for non-native speakers some potential answers / aides have been added to a few of the questions. I am keen for the ‘students’ to feel challenged, to have fun, to understand the need to take note of the previous answer (in order that the character development will flow more smoothly through linked answering) and to feel confident to collaborate and participate in a group decision. A number of postcard sized photographs all showing a different, unrelated, random image. A number of self sealed envelopes to put each image in, a number of pre-printed questionnaires and something to write with would be additional materials needed during the session. Who are you ? Are you human or an animal or an alien or a fictional creature ? What work do you do ? A job ? What do you dream of doing ? What secret have you never told anyone ? The ‘students’ are asked to open their envelopes but not show it to the neighbour. Then immediately they are to answer a series of questions. Each time they answer their question they are to hand the picture and answer sheet to their left hand neighbour. From the first move you must consider the last question and answer. Once the 8 answers have been answered the group will collectively agree to choose 1 questionnaire that has by now formed a character. They then need to agree which other character (from the remaining questionnaires) would be the best companion for the first choice. The time went quickly, a bit of procrastination as the start but all the questions were answered within the allocated 5 minutes for the first stage. There were only 4 in the group (a Prop Maker, a student designer, a friend of mine and a friend of a friend – they had not to know each other or else the collaborative element might not have worked) and therefore it was relatively straight forward to get a compromise / collaboration of ideas flowing in the second section. I think that if the group were much younger then the outcome may not have been so straight forward. The feedback reiterated this and it was also mentioned by one person that she thought that the second part of the session felt like an add on… this was partially correct as the original Insights brief was for the individuals to go on to draw their character that they started with and then to make a 3D version out of it in wire, newspaper and plastercine. there simply wasn’t enough time to do this so the brief was changed according to the 10minute rule (baring in mind that the original brief wasn’t about collaborating . The group loved the ‘choose a companion’ from the remaining characters which led to much fun debating and laughing as all four characters were described and compared…I do feel that this would have, as designed, broken down any barriers or shyness between the group members as it is important for the atmosphere to be fun and a bit frivolous. It was also noted how much the group members strayed away from the original photos but not from the answer from the previous person; perhaps this is a ‘out of respect’ phenomena? The feedback ‘session’ continued with laughter and much ‘what if’s’ so the group had obviously enjoyed the process. I would like to try this brief on some Diagnostic students when they start on Foundation in September 2018 to get a more accurate reaction. It is hard to quantify collaboration with larger groups and with some rooms containing between 30 and 60 students dividing them into groups of 6 or 7 would be most suitable but then one lecturer can not listen in to the second part of the session – perhaps this might not be necessary if the noise levels increase thereby telling me that they are all talking and enjoying themselves and the project. I have found this a very rewarding and fulfilling project which gives me the confidence to think up others that might have an equally deserved effect.